A versatile player who was at home at either end of the ground but most effective as a forward, Darryl Sutton played senior football for six clubs across three states over a career that spanned 17 years. Born in 1952, Darryl Sutton first played senior football for Glenorchy when he was 18. In his third season, Sutton topped the TANFL goalkicking table with 73 goals, despite the Magpies missing the finals. This brought him to the attention of VFL recruiters, and in 1973 Sutton began his first stint in the VFL with North Melbourne. He would play only seven games that season after struggling for most of the year with glandular fever, and at season’s end he returned to Glenorchy. Sutton would play a further two seasons with the Magpies, and his time at the club would end on the highest possible note, captaining the side to TANFL and state premiership triumphs in 1975, as well as at the “Championship of Australia” post-season tournament. After these successes North Melbourne approached Sutton about returning to the VFL, and in 1976 he returned to Arden St. 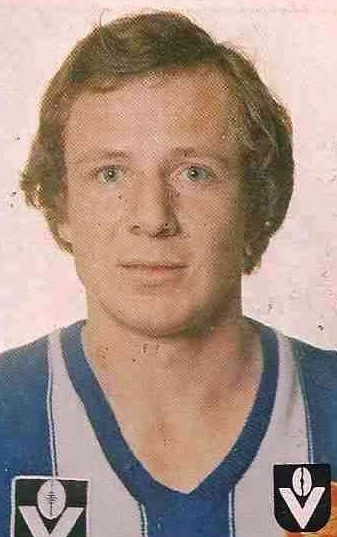 Playing a mixture of roles in both attack and defence, Sutton rejoined the Roos in the midst of their first golden era under Ron Barassi, and in his first season back he played in three finals including a thrilling one-point preliminary final win over Carlton, in which Sutton kicked five goals, and the losing Grand Final against Hawthorn the following week. The next year the Roos would go one better, with Sutton playing a starring role at Centre Half Forward in both Grand Finals against Collingwood. After his second stint at North Melbourne had yielded 84 games in five years, Sutton sought greener pastures and travelled across the country to play with Swan Districts in the WANFL in 1981. However his form was poor in a Swans side that made the preliminary final, and the following year he was back in the VFL, this time with Richmond. Sutton’s time at the Tigers featured much more time in the reserves than the seniors, with only six senior appearances in one and a half seasons at Punt Road. As a result, Sutton moved to Sydney mid-way through 1983 and finished his VFL career with the Swans, playing 14 games and booting 25 goals, including 6.6 against Melbourne. He ended his VFL career with a total of 111 games and 90 goals in eight seasons in Victoria. At the age of 31, Sutton returned to Tasmania and was appointed captain-coach of North Hobart in the TANFL. He would maintain some strong form, topping the Demons goalkicking in 1984 and 1985. His final season would be the inaugural year of the TFL Statewide League in 1986, where he would steer North Hobart to a finals appearance, and would crush Hobart in an Elimination Final before bowing at the hands of Clarence a week later. Daryl Sutton passed away in 2017 at the age of 64.